This topic is about the conditions focal segmental glomerulosclerosis (FSGS) and IgM nephropathy, which cause nephrotic syndrome. This causes swelling in the body, especially in their face, legs and feet. The main treatment is medicines called steroids. But in some children, the nephrotic syndrome may keep coming back. Your doctor may arrange some tests to find out if the nephrotic syndrome is caused by FSGS or IgM nephropathy – children with these conditions need further treatment. long-term effects of FSGS and IgM nephropathy. You may also wish to read the infoKID topic Nephrotic syndrome, which covers symptoms and signs, tests and diagnosis, and early treatment of nephrotic syndrome. There are different types of nephrotic syndrome. About 9 in 10 children with nephrotic syndrome have a type that can be treated with steroids – this is called steroid-sensitive nephrotic syndrome (SSNS) (it is “sensitive” to steroids). In some children, the nephrotic syndrome keeps coming back after treatment – this is called frequently relapsing nephrotic syndrome. About 1 out of 10 children with nephrotic syndrome have a type that is caused by FSGS or IgM nephropathy. These conditions affect the kidneys’ tiny filters called glomeruli. glomerulosclerosis – there is scarring on the glomeruli (“sclerosis” means scarring). IgM is short for immunoglobulin M. This is a type of protein that the body makes to fight infection. In IgM nephropathy, this protein gets trapped in the glomeruli. The symptoms and signs are similar for all types of nephrotic syndrome. The main symptom is swelling or puffiness in different parts of the body, especially around the eyes, legs and feet. This is called oedema. The swelling happens because the kidneys leak a lot of protein in the urine (which is called proteinuria). You cannot usually see the protein, though it can be found in a simple urine test. rarely, other symptoms such as a very swollen tummy or breathlessness. Complications, or further problems, are rare. Because of the treatment, some children are more likely to get infections. fever (temperature above 38°C) – your child may sweat more than usual or be shivery. swollen, red or painful leg – this may be a sign of a blood clot. FSGS and IgM nephropathy are rare. About 1 in 50,000 children get nephrotic syndrome each year, but only about 1 in 10 of these cases are due to these conditions. Ocasionally, FSGS can be caused by a genetic mutation that may run in families. Genetic mutations are problems in the genes (which are in each of our body’s living cells), which are passed on by the parents. It is not always known why some children get FSGS or IgM nephropathy. It is often considered to be linked to a problem with the immune system, which is the body’s way of protecting itself from infection. Some children who have had frequently relapsing nephrotic syndrome can develop FSGS or IgM nephropathy after many years. If your doctor thinks that your child has FSGS or IgM nephropathy, he or she may be referred to a paediatric renal unit, a special unit for children with kidney conditions, which may be in a different hospital to your own. A paediatric nephrologist, a doctor who treats children with kidney problems, can advise on further tests or treatment. has nephrotic syndrome that keeps coming back (frequently relapsing) in spite of taking extra medicines. A kidney biopsy can confirm FSGS or IgM nephropathy. A tiny piece of one kidney is removed from the body with a needle and examined under microscopes. Special medicines are used so your child does not feel any pain or can sleep through the procedure. In FSGS or IgM nephropathy, the symptoms of nephrotic syndrome cannot be treated by steroids alone. Your child may need to take stronger immunosuppressant medicines, which make the immune system less active so it does not harm the kidneys. Some children need to take medicines to prevent or treat infections, or to treat complications. You will need to test your child’s urine for protein every morning while your child is on steroids or immunosuppressants. A nurse will show you how to do this. If there is no or very little protein in the urine and the swelling goes down, the condition has gone into remission. If there is protein in the urine again, this is a relapse. You will need to contact your doctor, and your child may need another course of steroid or immunosuppressant medicines. All children with FSGS or IgM nephropathy will need to go back to the hospital for follow-up appointments to check for any health problems. Your healthcare team will speak with you and your child about any long-term effects your child might have with FSGS or IgM nephropathy. Some children have no long-term problems with their kidney function (how well their kidneys are working). If the condition goes away, this is called remission. In some children, the kidneys stop working as well as they should – this can happen slowly, over many years. This is called chronic kidney disease (CKD). These children will need to go back to the hospital or clinic for regular follow-up appointments. You and your child will learn more about this condition over time and about what to expect and how to help manage the condition. The main symptoms and signs for FSGS and IgM nephropathy are similar to those in other types of nephrotic syndrome. Children have swelling or puffiness in different parts of their body – this is called oedema. The oedema is normally around the eyes in the morning, and in the legs and feet later in the day. After a while there may be swelling throughout the day. Boys may also have oedema of the scrotum. It is pitting oedema. This means that when the affected area is gently pushed, there is a small dent for a few moments. In FSGS and IgM nephropathy, the swelling happens because there is too much fluid in the body’s soft tissues. This is caused by the kidneys leaking a lot of protein, which is normally in the bloodstream, into the urine. An abnormal amount of protein in the urine is proteinuria. You cannot usually see the protein. Your child’s doctor can find proteinuria on a urine test. A lot of the protein that is leaked is a type called albumin. Albumin helps keep fluid in the blood. Fluid moves between the blood and the body’s soft tissues, and when there is not enough albumin in the blood, fluid stays in the soft tissues. Some children urinate less often or smaller amounts. Some children also have haematuria (blood in their urine), which happens when red blood cells leak through the kidney’s filters into the urine. Sometimes you cannot see the blood, but if there is a lot, the urine may be coloured red or dark brown (like blackcurrant squash or a cola drink). If your child has FSGS or IgM nephropathy and a very swollen tummy or feels breathless, contact your doctor as soon as possible. Some children have complications – health problems that happen because of the condition or its treatment. These are very rare but are more likely to happen if the oedema lasts a long time. Children with FSGS and IgM nephropathy are treated with medicines that suppress, or damp down, their immune system, which normally protects them from infections. They are therefore more likely to get infections such as the common cold or a urinary tract infection. Peritonitis is inflammation (like a swelling) of the peritoneum. This is a thin layer that lines the inside of the abdomen. It surrounds and supports organs such as the stomach and liver. Peritonitis is caused by a bacterial infection. Children with peritonitis have severe pain in their tummy and a fever (temperature above 38°C), and may sweat and/or seem shivery. In nephrotic syndrome, blood may be thicker than normal. This happens when some of the water in the blood leaks out of the blood vessels. The blood is more likely to form a blood clot (like a clump of hardened blood). If a blood clot is large enough to block a vein, it can cause thrombosis. The leg, or occasionally another part of the body, may look swollen and may look red and feel painful. Hypertension is blood pressure that is too high. In some children, this leads to headaches, vomiting or blurred (fuzzy) vision. Hypertension that lasts a long time can also increase the risk of getting other diseases in adulthood. If your child has hypertension, he or she may need to make changes to his or her diet, or take medicines to get their blood pressure in a healthy range. The thyroid is a gland in the neck that makes thyroid hormone. This hormone (a chemical that is carried in the blood to send messages to other parts of the body) controls how the body uses energy. A few children have swelling of the lining of their gut. This can cause diarrhoea. Rarely, children with FSGS and IgM nephropathy have too much of some fats in their blood – even when they eat a healthy diet and are active. This is more likely in children who have proteinuria for long periods of time. cholesterol – a high level of this is called hypercholesterolaemia. Eating a healthy diet and being active usually helps keep these fats at a healthy level. But in nephrotic syndrome, there is a lower level of some proteins, especially albumin, in the blood because they are leaked into urine. This causes the levels of fats to increase. In serious cases, the kidneys stop working as well as they should, over a short period of time – this is called acute kidney injury (AKI). Some children get better after a few weeks, and some need to take medicines or have more intensive treatment. FSGS and IgM nephropathy lead to nephrotic syndrome – the kidneys leak a lot of protein into urine. This leads to a drop in the levels of protein in the blood, which causes swelling in the body (oedema). Protein is an important part of our diet and is in most foods. When we eat protein, it is digested (broken down) in the stomach and intestines and taken into the blood. It is important that we have the right amounts of protein in our body to stay healthy. Normally, most protein stays in the blood and does not get removed by the kidneys into the urine. This is mostly because proteins are too big to pass through the glomeruli. 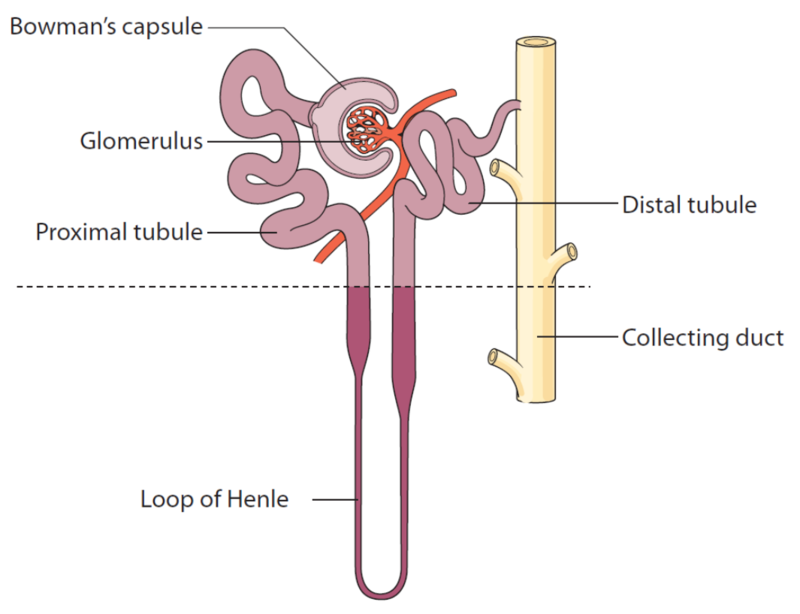 In nephrotic syndrome, there is a change in the glomeruli. They become more leaky, and so some proteins pass through, leaving the body in urine. The main protein that leaks out is albumin which is quite a small protein and more likely to leak through the glomeruli. Who gets FSGS and IgM nephropathy? FSGS and IgM nephropathy is rare. About 1 in 50,000 children get nephrotic syndrome each year, but only about 1 in 10 of these cases are due to these conditions. It is not always known why some children get FSGS or IgM nephropathy. It is often considered to be linked to a problem with the immune system, which is the body’s way of protecting itself from infection. Some cases of FSGS and IgM nephropathy are due to other reasons, though these are more rare. Genetic mutation – some children have a genetic mutation that affects the structure of part of the glomerulus in the kidney, which causes the protein leak. Genetic mutations are problems in the genes (which are in each of our body’s living cells), which are passed on by the parents. Your doctor will talk to you about this, and may arrange for a genetic test to be done. It is very rare for FSGS, and even rarer for IgM nephropathy, to run in families. Your child’s doctor will ask about any family history of these conditions, and it is usual to arrange for siblings to have a urine test to check for protein. Your doctor may have diagnosed (identified) nephrotic syndrome before suspecting FSGS or IgM nephropathy. To find out how nephrotic syndrome is first diagnosed, go to Nephrotic syndrome – steroid-sensitive: Tests and diagnosis. a genetic test and genetic counselling – to check if your child has a faulty gene (genetic mutation). Genetic testing usually involves getting a sample of blood or body tissue, which can be checked for a specific gene. Genetic counselling is a service that can give you information and guidance about conditions caused by genetic mutations. A kidney biopsy can usually confirm whether a child has FSGS or IgM nephropathy or any other abnormalities. It can also give more information about how much damage there is in the kidney. A tiny piece of one kidney is removed from the body with a needle – special medicines are used so your child does not feel any pain or can sleep through the procedure. The sample is sent to a laboratory where it is looked at under microscopes. It can also be checked for proteins related to the immune system. Imaging tests (scans) use special equipment to get images (pictures) of the inside of your child’s body. In FSGS or IgM nephropathy, the symptoms of nephrotic syndrome usually cannot be treated by steroids alone. Your child may need to take stronger immunosuppressant medicines, which reduce the effect of the immune system on the kidneys. Some children need treatment for any complications – to prevent or treat infections, reduce oedema (swelling in the body) or reduce the levels of fats in the blood. Once your child is diagnosed with FSGS or IgM nephropathy – usually after a kidney biopsy – your doctor will decide on the best treatment. The first treatment for nephrotic syndrome is a steroid medicine, usually prednisolone. Steroids are chemicals that are made naturally in the body, but can also be made as medicines. They suppress the immune system, or make it less active. Your doctor will give you more information about how and when your child should take the medicine. It is important that you continue giving the steroid to your child as your doctor has told you, even if your child is getting better. Stopping steroids suddenly can make your child very unwell, so your child should only stop taking steroid medicines on the advice of your doctor. Children taking these medicines are more likely to get infections. Speak with your doctor or nurse, and your child’s teacher or daycare manager, about how you can help prevent infection. Although we use these medicines to try to treat nephrotic syndrome, some, especially tacrolimus and ciclosporin, may have an effect on kidney function (how well the kidneys work). Your child’s healthcare team will closely monitor the levels of these medicines in regular blood tests. Your child may need to make temporary changes to what he or she eats. For example, he or she may need to eat less salt while they have oedema or are taking steroids. This is because higher levels of salt in the body cause the kidneys to keep more water. Your doctor, nurse or dietitian will help you and your child make these changes. reducing the level of fats in their blood. treating low levels of thyroid hormone. Your child may be at higher risk of getting infections when he or she is being treated for nephrotic syndrome. This is because the medicines suppress the immune system, so it cannot work as effectively to fight germs, and the oedema lets germs grow more easily. One important infection is peritonitis, which affects the peritoneum, the area around the organs in the abdomen (tummy area). Antibiotics are medicines that kill bacteria. Your child may need to take antibiotics to prevent or treat infection – this is often the medicine penicillin. To prevent infections, you may need to give a small amount of antibiotic twice a day while your child has oedema. Occasionally children with these conditions need to take diuretics. These medicines help reduce oedema by removing extra water and salt from the body, and by increasing the amount of urine that is passed. Your doctor will examine your child for oedema and measure your child’s weight while they are taking diuretics, to check how well the medicine is working. Some children need medicines to treat hyperlipidaemia, or high levels of fats, including cholesterol and triglycerides. Some children who have high levels of protein in their urine for a long time may be at risk of this. For some children, the kidneys do not work as well as normal during this illness – they have reduced kidney function. Most children do not need any special treatment, but will need long term follow-up because kidney function may slowly get worse over years. A small number of children with FSGS, and a very small number of children with IgM nephropathy will have more serious kidney problems and will need further treatment. This may include dialysis, which uses special equipment to ‘clean’ the blood, removing waste products and extra water and salts, and sometimes adding important salts. Will the conditions come back? How will I know? While your child is on steroids or immunosuppressants, you will need to test your child’s urine for protein every morning. Your doctor will let you know how often to test the urine and when you can stop. Some children, even when they do not have nephrotic syndrome or another kidney problem, have a very small amount of protein in their urine after standing or sitting upright for a few hours. For this reason, it is best to get a sample of your child’s first morning urine. This is the urine that your child passes when they first wake up in the morning. Put the dipstick in the urine sample, remove it and read the result. Use the instructions included in the package. If the urine dipstick shows either “trace” or no protein for three days in a row, and the swelling goes down, this means that the condition has gone into remission. Most children go into remission within 6 months of starting the immunosuppressants. Some have a lower level of proteinuria – this is called partial remission. If the urine dipstick shows either 3+ or 4+ protein for three days in a row, this means that there has been a relapse. The kidneys have started leaking protein again, and the symptoms may come back. Daily testing of your child’s urine will allow you to quickly detect a relapse. Your child will be able to start treatment, often without needing to go into hospital. If the urine tests are not used and your child has a relapse, they may become unwell and develop oedema, and are more likely to need to go into hospital. If the dipstick shows a relapse, contact your doctor as soon as possible. Your child will need another course of steroids or other immunosuppressants. You may be asked to measure your child’s blood pressure, using a blood pressure monitor that you can get from your doctor or a pharmacy. Your healthcare team will speak with you and your family about any long-term effects your child might have with FSGS and IgM nephropathy. Your child will have follow-up appointments and you may need to monitor him or her at home. Some children fully recover from these conditions – when the symptoms go away, this is called remission. Others may experience relapses – when the kidneys start leaking protein again and the symptoms reappear. These may be triggered by an infection, such as a cold. A few children have long-term problems with their kidneys. Your child will need to have follow-up appointments at the hospital or clinic to check for any health problems. Most children with FSGS and IgM nephropathy will go into remission within 6 months of starting the immunosuppressant medicines. Of those children who do not go into remission, some will have less proteinuria – this is called partial remission. Most children have at least one relapse. A few children have frequent relapses – this is called frequently relapsing nephrotic syndrome – and may need further treatment. Some children with these conditions may develop a low level of proteinuria (an abnormal amount of protein in the urine). Some children may have hypertension (high blood pressure), especially later in life. A few children develop long-term problems with their kidneys – this may be due to the problems with the condition or be a result of the treatment, such as some of the immunosuppressants that are needed. The kidneys stop working as well as they should. This is called chronic kidney disease (CKD). A very small number of children need dialysis and transplantation as a result of FSGS. FSGS may recur (come back) in the transplanted kidney. Your healthcare team will talk to you about this. Children who have been successfully treated for FSGS or IgM nephropathy can usually do the things that other children their age do. They should be able to continue going to school or nursery. They can play with other children and stay active. This is the end of the information on FSGS and IgM nephropathy. If you would like to read more about other kidney conditions, tests and diagnosis, treatment or supporting information, you can find a list of topics covered on the infoKID website at www.infokid.org.uk.